Devoid Of Culture And Indifferent To The Arts: Recipe: Yuck! You're going to eat that?!? Have you ever prepared squid at home? Making calamari requires a deep fryer to get it right and that's one device I don't trust. There's something about a gallon of fat nearly at the ignition point that gives me the willies. 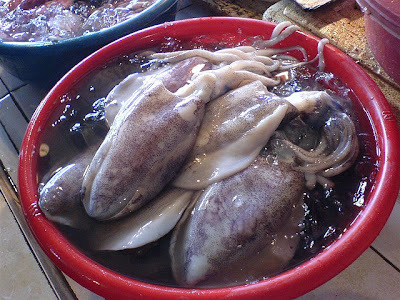 But that's no reason that squid – a healthy inexpensive main – should not be part of your culinary repertoire. There are many ways to cook squid. There is one rule of thumb that I have found: either cook it for 30 seconds or 30 minutes. Nothing in between or it's tough. The recipe that follows is a fantastic way to serve it. Choose a side dish and some bread and you have a delicious meal. I also give a recipe on making black pasta, which uses the ink from the cleaned squid. It's very chic and impressive looking. Squid are marine cephalopods of the order Teuthida, which comprises around 300 species. Like all other cephalopods, squid have a distinct head, bilateral symmetry, a mantle, and arms. Squid, like cuttlefish, have eight arms arranged in pairs and two, usually longer, tentacles. Squid are strong swimmers and certain species can 'fly' for short distances out of the water. Many species are popular as food in China, Greece, Turkey, Japan, Portugal, Italy, Spain, Korea, India, and the Philippines. 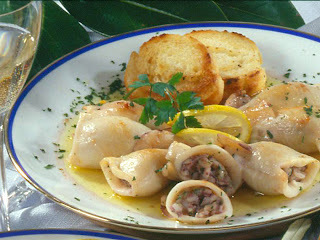 In English-speaking countries, squid is often marketed using the Italian word calamari. Squid are found abundantly in many areas, and provide large catches for fisheries. The body can be stuffed whole, cut into flat pieces or sliced into rings. The arms, tentacles and ink are also edible; in fact, the only parts that are not eaten are the beak, internal organs and cartilage in the hood. Squid is a good source of zinc, manganese and is high in the recommended daily intake of copper, selenium, vitamin B12, and riboflavin. This first part seems a bit gross, but it's not…really. To clean the squid grasp the head just below the eyes, pull it out from the rest of the body (the "mantle"), and set it aside. Pull away the thin purplish membrane on the outside of the mantle. Pull out and discard any "entrails" and the thin cartilage from the inside. Try to get it in one piece. It's easier that way to get it all. Remove back fins gently, trying not to rip holes in the mantle. If the mantles are torn they will split open when baked. Rinse well. Cut tentacles off just below the eyes. Push beak out, remove, and finely mince the remaining tentacles. These will be sautéed in the stuffing later. The following video is a demonstration of how to clean a fresh squid, from Harbor Fish Market, Portland, Maine. Very instructive. Note to the adventurous: The black sac that remains with the eyes is the ink. It's used to make "black" pasta. Squid ink costs a fair bit, about $6 for 0.5 oz, and you can freeze it to use later if you wish. 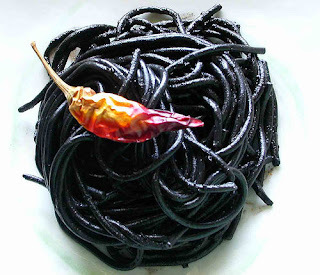 But it's best fresh so perhaps make black pasta to accompany the meal. See recipe below this one. Cook the rice in 2 cups of water and a little salt. Cover, bring to a boil, turn down heat and simmer for 15 minutes. Let sit off the heat for 5 minutes. Meanwhile, in a large skillet, heat 1/4 cup of the olive oil and saute onion until softened. Add garlic and cook for 1 minute more. Add the currants, pine nuts and chopped tentacles. Season with half the salt and pepper. Cook until the squid has turned opaque (a little pink). Add the white wine and cook until it evaporates. Stir in the cooked rice, mint and cayenne. Mix to incorporate all the ingredients well. Taste and adjust seasoning. Carefully fill the prepared squid tubes to 3/4 full. They will shrink when cooking. You can do it with a spoon but it's messy and takes forever. I use a plastic bag with the corner cut off. Fill with stuffing mixture, snip off the corner, stick the end in each tube and squeeze. Much easier. Place the filled tubes side by side in a 9x13 baking dish. Sprinkle with remaining salt and pepper. Pour remaining 1 cup of oil and 1 cup of wine around the squid. Cover with foil and bake for 45 minutes. Serve with a little of the olive oil/wine mixture drizzled on top. Very good with a Greek salad (or black pasta) and some crusty bread. Make pasta as usual, incorporating the ink with the eggs at the beginning step. See the following short directions (or my previous post on the Mercato Pasta maker). Mound of the flour on a large wooden cutting board (or just put it in a bowl like I do). Make a well in the middle of the flour and add the eggs, oil and squid ink. Combine egg mixture slowly with the flour using a fork. Continue until all of the flour is incorporated or the dough won't absorb any more. Never force more flour into pasta than the liquid is willing to take. Start kneading the dough. Once you have a mass, continue kneading for 3 more minutes. The dough should be elastic and a little sticky. Knead for another 3 minutes, dusting with flour as needed. Wrap the dough in plastic and allow to rest for 30 minutes at room temperature. Roll pasta as usual. Black pasta is often served with cream-based sauces to serve as a contrast, but it doesn't have to be. The ink adds no discernible flavour.